I went to a tourist town/village today in early April. Monpazier, a famous bastide town, was lovely as always. It is always crowded in July and August, even in June. Today instead of too many people, there were too few. Empty. Empty. Empty. I also stopped by Monflanquin. It too is a tourist town in summer. It was the same time of day but not the same crowd. People were everywhere: kids, rush hour, shoppers, everybody. It’s not true that it is dead. It is just not full of tourists. Merchants there say “oh you can’t sell much here. It is dead without tourists.” I don’t think so. It is a living town with an added bonus, the summer tourism. I found out that Jean Luc Nicolas used our ground floor to build one of his many boats. He says he’s built 23 all together but three in our village. The one built across the street from our house is the most notorious. It alone is the stuff of legend. The others seem to be accepted as part of everyday life. The first tale we heard from our elderly neighbor across the street. [He told the story in the regional patois that is very hard to understand, but it adds a certain something to the legendary quality of the story]. We might have been folklorists hearing a centuries old tale. It seems that once a man wanted to build a boat. The old empty church seemed perfect; the roof was solid and the space was wide and high. The space was almost a ruin. And so the boat was built, over time, by hand, beautifully. Time came to get it to the river about 20 kilometers away. The boat came together piece by piece. She was now ready to go, assembled. The church had had four walls then. Today the church has three walls but no boat. Jean Luc bashed in the south wall. Many neighbors carried her out to the Place Marronier; freeing her from her from her sanctuary. An international team of aging eccentrics (Anglos Belge, and French) ferried her down steep Rue Basse, then out to the national road— the N 21. There they met the large lorry that hoisted her up and away to the river, perhaps it was the Lot, perhaps the Garonne. When I finally met Jean Luc I understood how he became a legend. Strong and small with wispy white hair, sparkling sharp blue eyes, and a fine nose; Jean Luc might be mistaken for a bum or some legendary professor. What is more, he likes old buildings, respects old stone, and loves their history. That’s rare amongst the French. [It’s the Brits and the Americans that really love old stone]. But Jean Luc is an independent and dances to his own bourée. He still wrestles regularly in Villeneuve-sur-Lot even though he is close to 65. His two sons are 19 and ten. Their mom is one of the people from Algeria who settled in Cancon after the Algerian civil war. 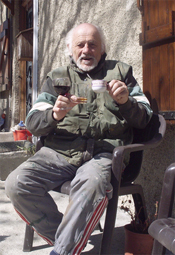 Jean Luc lives 15 minutes south in the big town, Villeneuve-sur-Lot, and always drives north to Cancon from Fall to Spring in order to work in the past on his boats and now on his house. 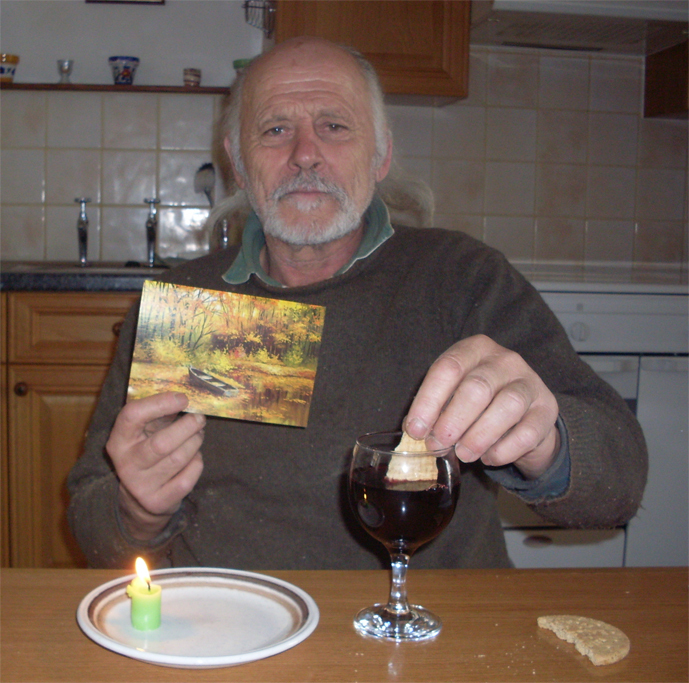 He pilots and poles “The Noah” in Brantome farther north, on the river Dronne, in the Perigord. It is a tourist boat. He made it on our hill next to the spot his house is rising. Jean Luc was Christened “Noah” when they carried that boat down from the heights of Cancon a few years ago. It must have been a motley team of characters trudging down Rue Mengane, out to the great truck that would then carry the boat to Brantome. Some of the guys that carried this boat live here in the village and could as well be part of a Monty Python cast as anything else. Jean Luc had already done this twice before. Characters on the Rue Mangane. Jean Luc and Peter Clements welcome me. We aren’t your usual village—or perhaps I only really know the characters. Now He’s Building His House. Every day, I hear hammering from across the Place de Marronier. It is Jean Luc—getting his day started. He drops by Peter Clements’ and has his coffee. He does some work and then he joins Peter for lunch. I join them sometimes too. Once he brought Cassoulet and once we had beans and sausage. He likes his big meal mid-day not at night. By mid to late afternoon he is back at work on his house. That is after he’s had his tea with a drop of whisky and perhaps a glass of wine. His family home is on the Rue Mangane. When his generation inherited the house, his sister, Jo Elle bought it from her siblings then he bought the garden from her. The garden is across the lane and up the hill. Many of the Rue Mangane gardens are quite small but his is large. All our houses were built of stone in the 14th century with half timbering and colombage. His new house is all wood. Stone sinks but wood floats. You know he is a boat builder; his home is like a river-boat; it’s just upside down. His little garden shed has always seemed a bit of a hovel to me. Dug deep into the hillside, maybe Bilbo Baggins lived there earlier. It still looks pretty bad, but now it has a crown. His new “family” home is rising up on top of the shed. The garden shed is not the entry. It will soon be integrated into the fabric of the main level up the hill. You must realize that today, and yesterday, and 700 years ago undressed rock is/was free. It is everywhere in the Haute Agenais. It takes labor to make the rock beautiful. But that is about all it takes. It’s what costs money today. But wood was more useful as fuel in the old days. Today it’s a resource that comes from the Polish forests and costs a lot of money in France. [Peter and I shipped the wood for our house from the US and we still saved money, a lot of money.] Jean Luc’s house is a prize that’s hard to come by in our hilltop world. An intricately made craft for himself to steady up on dry land when he no longer has the strength to pole the tourists down and back up the river. Furthermore, he declines all help to build or plumb it. It must be all his. Jouyeaux Fetes de la Fin de l’Année! So many people have asked me to write about our time in France over Christmas I shall have to try. Upon our arrival we stayed with Jean & Kate in their home in the village of Cernay generally located in the national forest of the Chevreuse, just past the end of the commuter train line from Paris. We could hear the hunters and even see them from time to time. Lutz, the Guyot’s elderly dog, seldom goes into the forest now since such a long walk is a bit too much for her. Even when younger, the sound of gunfire kept her out of the woods during hunting season. I am used to hunters being away from the people, but here the ancient villages are tucked amongst the forest trees. It is much, much harder to be really remote in this fairly secluded spot. They hunt sanglier (wild boar) & fallow deer for the most part and I am reminded of the 14th C. Book of Hunting by Gaston Phebus…..
Paris was sunny and the countryside was beautiful. It became comfortably warm in the early afternoon. When we drove south toward “home” in the blinding light of the low winter sun, we were really exhausted by the drive and the constant glare. It soon became grey and foggy both in Paris and Cancon. The fog lasted several days but we never had the beautiful frozen fog we had had here in 2006. We are in the “gite” we have rented so often. (Our house is not winter worthy yet.) This lovely 13th C. home is especially comfortable upstairs since it has well insulated walls and electric radiators. Downstairs the stonewalls are hard to heat up and it is always feels a bit chilly unless we have a fire. We are burning a lot of the wood our landlord provides. Peter is working on the third level of our house—where he is much warmer on sunny days. The skylights help and the rooms all have drywall and insulation now. He says it becomes a real puzzle when he has to cut drywall to fit all the intricate spaces formed by the ancient roof timbers. This is a slow going part of the work since it involves completing the electric wiring as each wall is completed (the French system is “interesting” he says), but he expects to have all the newly framed walls insulated and drywalled by January 7. The walls to the neighbors’ houses are a different matter. Each opening that was formerly filled with “torchi” will have to be individually furred out, insulated, drywalled and electrified if necessary. We left for Christmas festivities back in Cernay. Driving north the sun was behind us; when we drove home after Christmas we weren’t blinded either for it was deep fog as far as Perigeaux. Just as last year, all 3 celebrations revolved around family and feasts. There is so much less Christmas commerce involved in the community around us, enough to know it is the season of special joy but not so much as to be overwhelming and boring. Two of our feasts were with Jean & Kate, and Valerie & Claude. The Christmas feast was with Jean’s sister and brother-in-law Nicole & André. Their home is about an hour north west of Cernay through forest we’d never seen. Our feasts all began with fois gras with different white wines (the Vouvrey was the most wonderful). Once our main course was coq-au-vin and once we had an incredible chicken called a “poulard” cooked with a white sauce of great delicacy. The “poulard” is a huge, tender, free-range chicken. Since it is younger than a hen, it has never been fertilized. They are raised all over France but this particular one was from Brittany. All the rest of each meal was tantalizing and so spread out over the evening that we managed to finish each course. We had many wines with our meals, but the sine qua non was a 1970 Burgundy, inherited by André from the year their daughter Christine was born. Christine and her young family were with us at the Christmas feast. Another treat was a really big, aged Graves that I bought in St. Emillion during the summer, in order to take up north for Christmas. It is interesting to me that both Kate and Nicole learned to cook from Jean’s mother, who must have been a fabulous cook and a great teacher. I asked Kate if they both cooked similarly, in as much as they had the same teacher. Kate indicated that they didn’t; Nicole tends to prepare heartier main courses, and Kate’s, I observe, are full of complex flavors and are very delicate. Nicole prepared the coq-au-vin and Kate prepared the poulard mentioned earlier. I suspect these two versions of poultry are a good summary of the differences. Both women have grown in their cooking and have developed their own “voices” in the kitchen despite their similar early start. Peter & I have been blessed by having been served so many of Kate’s meals. I have never eaten anything more wonderful—over and over. I always think of “Babette’s Feast” and I recognize in myself the epiphany the two rigorous, protestant Danish women had upon eating Babette’s feast. Yes there is certainly the advantage of access to the freshest regional produce and the finest meats bought from the best farmers. It is more than that too. It is of course the great skill of the cook. But it is more than that too. It includes the consistency of both the great meals and the simple lunches, the ritualized order to the meal’s presentation, the length of time the meal always is allowed. It is the knowledge that the meal is prepared with the cook’s love and her knowledge that her work is vital to the emotional wellbeing of the family. And that they too know how important it is. I have never looked at cooking that way. I always felt that meals kept you alive but that the preparation was certainly nothing more than a waste since it was all consumed and their was no product unless it was the left-overs that saved on the next day’s cooking. The attitude of the family toward the food seems crucial too. They must do everything they can to be on time and to not miss a meal. The other adults all must appreciate the meal and tell the children how special the food is to them all and how important the preparation is. It just isn’t enough for the meal to be the cook’s fun or challenge. It has to be a family affair. These are things Kate & Jean, Valerie & Claude, Nicole & André, Christine & Matheau and their girls are teaching me. Once we came home to Cancon life continued much as before. Peter is still working on the 3rd floor (deuxieme étage) and I stay by the fire and read. or write, or edit presentations for my web class. But we have a charming guest too. Lutz, the elderly dog I mentioned earlier, came down with us. She is old and she is eloquent about what she wants; usually it’s a “bon bon” a dog treat. The neighborhood cats are pretty scarce. She has little work guarding us from them. 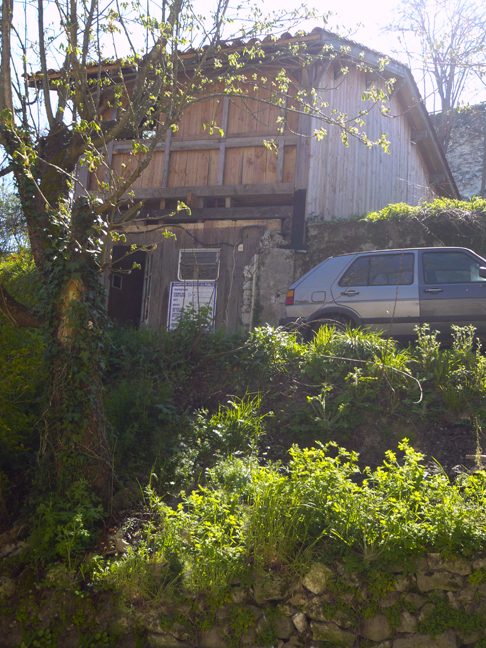 Best of all, the factrice (mail woman) doesn’t deliver our mail to the gite but to our house under construction. So Lutz’ most deadly enemy does not disturb her sleep. She is a bit bored with no work to do defending the castle. Once, out walking, we came across a small yellow cat almost hiding in a secret sunny spot. The cat didn’t bother our dog, but Lutz literally shook for a half hour after that unexpected close encounter with the enemy. 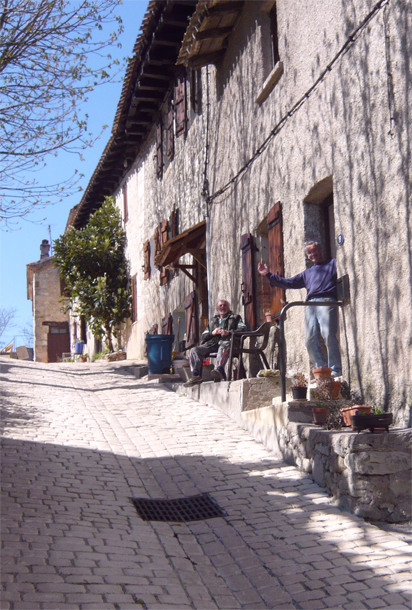 We’ve had brilliantly sunny weather and we’ve gotten some lovely photographs of an early medieval town nearby as well as images from two nearby Bastide Towns. I had hoped to make a film of these contrasting places but our camera didn’t work out, so now I will produce a digital presentation about the “city as an art form” to use in my comparative arts class. I’ve always described the land for you; it is such an important part of our visual experience. This end of the year is no exception. During the whole month there has been constant change in the land. This time the change is due to humans, not nature. At first a few fields had been broken with huge moist clots of earth. Peter thinks they might be fifty pounds each. Eventually those fields had been plowed again and then again. Other fields joining the rotation soon added more big clots, then finer, until the fine earth was smooth. On one side of the narrow road the ground might look like the 70% cacao chocolate bars we’re so fond of here; on the opposite side we often find something that looks like caramel. Why is there such a strong difference? About the time we leave, the first fields are already turning green! They look like early days on a chia pet, but you know they really are green and sort of fuzzy. The hazelnut trees all have soft green flags on them. The plums are being pruned. The grapes have all been pruned and the air is smoky with the burning of the prunings—the best way to prevent disease. We actually see a few people amongst the vines and more up in the plum trees. How there are so few people visible on the land from season to season amazes me. But then aqain we’ve never been here in the fall. Actually I’m writing from Conques, the site of the large, gold reliquary of Ste. Foy. Many of you know how passionate I am about this hidden valley, its Romanesque Abbey church (Ste. Foy), and the Hostelerie de l’Abbey The hostelerie is a place to stay that has the wild beauty of the Aveyron out the back terrace, and the solid order of the tympanum of Christ-in-Majesty out the front door. The order of the heavenly city on Christ’s right. The Chaos of Hell on left. I left Cancon [shutting up the house 2 days early] because I found out the Center for European Medieval Studies Music Festival was presenting a concert of the “Cantigas de Santa Maria” last night. You may know that I’ve been studying these Cantigas of Alphonso X for several years. They are rarely performed. This performance was by an Iranian/European group of instrumentalists and vocalists. The reason this is significant is that the melding of the Islamic and Christian traditions were very important to the court of Alphonso el Sabio (the Wise.) The poetry of the Cantigas was written down, but the music was carried traditionally, one person to another and not written down. El Sabio’s court was notably integrated including Christians, Jews, Moors and North Africans. His musicians melded the cultures; so this period of thriving musicality can only be truly understood by the integration of Christian and Islamic vocal traditions and instruments. The concert was a knock out. Well worth the effort. It seems appropriate that my stay this summer should end with a concert of vocal music. The whole focus of this year’s trip seemed to be sound. Since, I was finally able to contribute to our house’s development. I had much to take up my time at our house. As a result, I listened day and night to a French classical radio station. What a station. This station presented vocal music almost entirely, but it also had a good bit of what we called “New Music” 40 years ago. Opera was 75% of the play-list; not just Mozart or all the 19th C. tragic scenes of love set adrift on a sea of misunderstanding. It included “Nixon in China,” “Wozek,” Stravinsky’s “Oedipus”…. There was also a lot of American jazz vocals, and there was a weird program called “Days of Wine and Roses.” O my, sometimes they would play truly awful American junky ballad stuff from the 60’s and 70’s. It might have been ok if you were French and couldn’t understand the words. At other times they’d play some good material from the 40’s. On other programs they’d have some odd little pieces from field collections in the US. Often there would be some American Hispanic music. Oddly, the station only played specifically American music. Otherwise, it presented a more catholic play list. It was an amazing mix. I learned to appreciate vocal music traditions in a way I never had before. A child growing up in a household which played this station all the time would have a fundamental relationship with vocal music that would be remarkable. The radio was a fine diversion from my work. I had walls to paint, rooms to furnish, construction materials to clean-up, sand to bag, boxes and boxes to unpack, new boxes of things to reorganize and put away. It was a clean slate to work on, sort of virgin territory. When we bought the building, our bedroom was really creepy with hunks of dirty fabric hanging from the great oak beams. It was the worst part of the house. The floor was almost non-existent. A fire in the room below had charred everything. Cobwebs hung everywhere with so much dust clinging to them they seemed solid not wispy. This was the place where Peter found his mummified half-a-cat. Grim! I’d wake every morning in our lovely sunny room and think about how amazing the changes were. The fine mosquito netting caused a slight blurring of the things in the room and looking toward the window, moiré patterns formed where the netting hung in irregular layers. I could lie awake and just enjoy the transformation. Later the sounds of our neighbors would entertain me. The older ladies in the Quatier Haute have gathered on our little street regularly. Everyone must pass by us to take trash to the recycling. What is more, Mme. Courtaud’s husband Gerrard “recovered” from his coma last Christmas and is at home under Mme.’s care. The ladies of the village all support her in these difficult times. I love the sound of their musical voices. I don’t understand them, so they are all the more musical to me. I told you about the Courtauds last January. I’ve also mentioned Pierette and Andre. She’s the Canconais and he the Quebecoise whose family home in Cancon fell down last year. They haven’t come back to Cancon from Quebec, but now our village wants her to donate her home and all the furniture her grandfather, the ebenistre, made, to the city for a museum. It’s a great plan, but the idea of her giving it all to the city is very offensive to her (the city was responsible for the collapse in the first place). Our little village buzzes with life. The local low-lifes are in Villeneuve-sur-Lot or in jail. Their houses have been filled with stable 30 something men and women who are raising children, teaching school, performing piano concerts around France, and generally contributing to the web of relationships that make our village so charming and authentic. I have learned that it is harder for a French person to try and join the village from outside the region than it is for us as Americans. Hervé, our grocer. says our village is very proud to have Americans. It adds status. Our new friend, Olivier, a yachtsman who has sailed from Tahiti all around the Americas, has settled here with his wife and daughter. He finds acceptance by the local people very difficult. I’ve mentioned Mme. Mocrannie before, she’s mother in the Algerian family who is still located in Cancon. They’ve been there since they were resettled in Cancon from Algeria after the war. They are still isolated in the village. Only Peter Clements and ourselves include her and speak with her on the street. It saddens me, but from an academic perspective I am fascinated by the hierarchies present on our old, old hill. 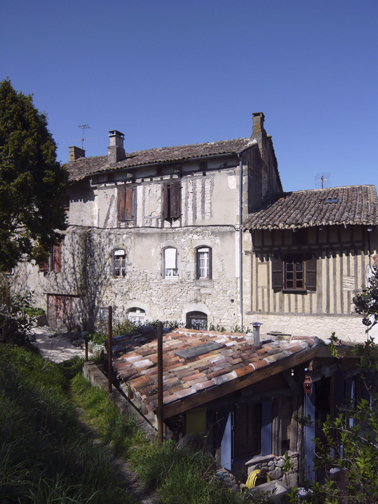 I am forgetting the news of our application to the Architect de Batiments de France for permission to restore the outside of our house. Our architect thinks he knows what they will approve. Some of it is good; some of it is bad. They will let us have great big wooden doors across the front on the ground floor and that is great. [I can’t see how it is traditional or architecturally accurate but it is what we want.] On the other hand, we can either set in new, well-dressed stones in the castle wall part of the house or we can cover the stones over with white Crepie (its kind of like stucco). We would like to repair the existing walls and leave the mismatched stone on the surface. On the front of the house we must cover our half timbering and the torchi with Crepie. Aesthetically perverse to us but historically accurate, it may look ok in the end, because we do have to install Renaissance windows on the premier etage. The Renaissance windows will be very beautiful. There was originally a third window on the front that we can also restore. We started our summer by driving to Andalucia from Cancon. After the Spanish Reconquista, Andalucia was the last area remaining to the Iberian Muslims. Of course they lost Cordoba and places south of it, but some were allowed to remain in Grenada. I have never before made the drive south in Spain all the way to the “bottom” of the peninsula. When I have gone to Spain before I either drove to Catalonia through the Eastern Pyrenees or I drove through “Green Spain” to Asturias or to Santiago de Compostella. was completely strange to me. What I noticed most of all was the naming of towns. We could follow the memory of the constant fighting of the Christians and the Muslims by means of town names. Towns ending in “de la Frontera” indicated fort towns on the edge of Christian territory established to protect the fierce border-lands. There were de la Fronteras in “Green Spain” close to the Bay of Biscay and ever South from the farthest North—the name repeated over and over. It seems so very strange to me to have the memory of wars 12 centuries ago imprinted on the land by its place names. In France we have similar place names: Castelsarrasan on the road from Agen to Toulouse is but one example. The Moors of course conquered territory as far as Poitiers-Tours where they were defeated in 732 by the Frankish Charles “Martel” and sent back south of the Pyrenees. remains impressive and very much present in a way that seemed unimportant in Southern Spain. I was most struck by the difference. I suspect the continued isolation of the Spanish communities in the north led them to assume control of their own worship and led to authentic religious expression unguided by a strong church hierarchy. The “Sacred Dirt” in the pilgrimage Church of El Nino de Atocha is frowned on by the priest but a major part of the religious traditions of the parish. I am studying the development of the “Alabados” songs in their worship and care for the sacraments by lay people. Since the church was so strong in Europe perhaps the people became more careless in their worship especially after the Inquisition ended. I have so many questions about the things I see and hear on my journeys and my sojourn in France that it is quite exciting. Upon our arrival we stayed with Jean & Kate in their home in the village of Cernay generally located in the national forest of the Chevreuse, just past the end of the commuter train line from Paris. We could hear the hunters and even see them from time to time. Lutz, the Guyot’s elderly dog, seldom goes into the forest now since such a long walk is a bit too much for her. Even when younger, the sound of gunfire kept her out of the woods during hunting season. I am used to hunters being away from the people, but here the ancient villages are tucked amongst the forest trees. It is much, much harder to be really remote in this fairly secluded spot. They hunt sanglier (wild boar) & fallow deer for the most part and I am reminded of the 14th C. Book of Hunting. Gaston Phoebus hunts the deer. Peter is working on the third level of our house—where he is much warmer on sunny days. The skylights help and the rooms all have drywall and insulation now. He says it becomes a real puzzle when he has to cut drywall to fit all the intricate spaces formed by the ancient roof timbers. This is a slow going part of the work since it involves completing the electric wiring as each wall is completed (the French system is “interesting” he says), but he expects to have all the newly framed walls insulated and drywalled by January 7. The walls to the neighbors’ houses are a different matter. Each opening that was formerly filled with “torchi” will have to be individually furred out, insulated, drywalled and electrified if necessary. fields once more. The sunflowers I anticipated in May and June are now in bloom. Their plantings are staggered so that the harvest is spread out; now some fields are brilliantly yellow and dark brown with only green showing at the edge of the fields. Other fields are in different stages of maturation: some barely show yellow; others are green, and yellow, and light brown. I have moved in to one room of our house, and I am equipped with shower, hot water, sinks, toilet, refrigerator, cook top, microwave. I am so happy to be here. Peter was able to sleep one night in our house before he had to go back to Fort Smith. Our roof is being re-done. It will have new tile, new insulation, and new beautiful yellow chestnut 4×4’s forming the ceiling and supporting the rest of the roof. Where the chestnut is in place, everything is perfumed, I hope forever. If it doesn’t last forever, its scent will stay in my memory. Now that our friend Amy is here and renting the gite next door, I am in a new phase of my experience. I have the joy of showing her all the wonderful hidden treasures as well as some not so hidden. 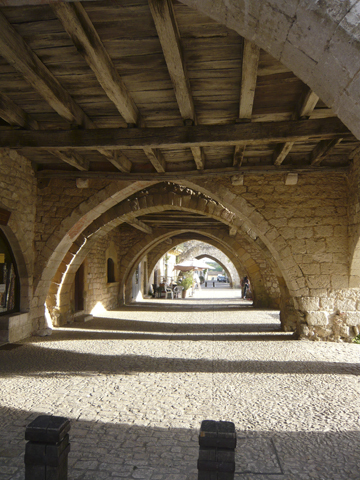 We’ve visited bastide towns small and large, walled and un-walled. Some are jewels just waiting for discovery (we hope not too soon) by the English. Some are totally Anglicized like Eymet, a charming place but with much less mystery in as much as most of the inhabitants speak English. Other bastides like Monpazier or Monflacon are often referred to as the prime examples of the bastides. 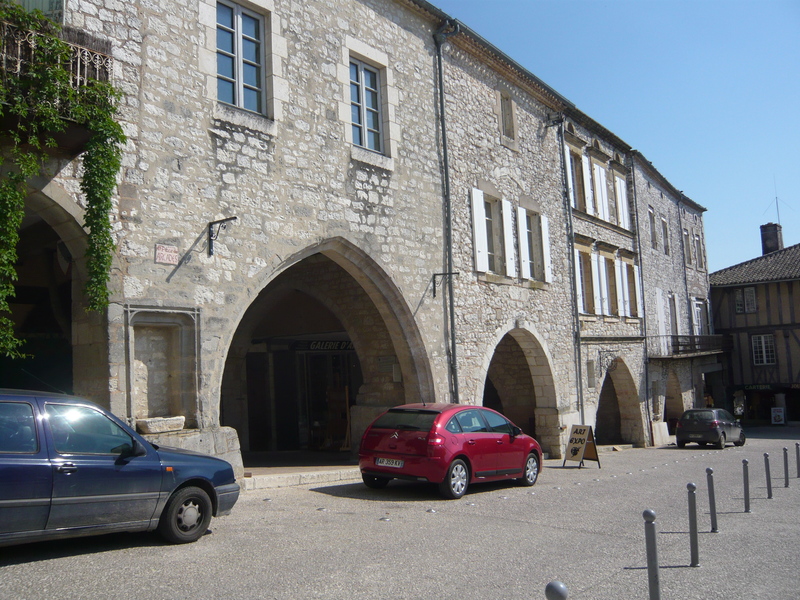 The bastides are the beginning of town planning (starting in 1226) and built over a 150-year period. Although many have been ruined by war and occupation (the Huguenots tore down the Catholic churches and the Catholics tore down the walls of Huguenot towns). Before the Wars of Religion, there was the 100 Years War when the adversaries were the English and the French and the towns changed hands frequently as well. There are many excellent art galleries to visit. The strongest, in my judgment, represent glass and excellent stoneware and porcelain work. Of course there is a lot of very poor work shown as well. I suppose some tourists will buy most anything as a reminder of their trip. Some heavily touristed towns have the ateliers of glass blowers and potters. The glass blowers are usually superb, producing functional glass as well as art pieces. One potter in Bergerac produces beautiful, well-displayed work in his gallery. In his storefront window his wheel and all the other accouterments of the thrower stand ready for him. Other places, higher end clothing shops, are filled with the sound of the sewing machine because the artist is making the clothes to be sold. Sunday and Castillonès on Tuesday. I think you better come here to discover what I mean. Nobody ever can imagine the vibrancy of the markets. There are street musicians, some good some bad. There are crowds of English and French happily buying the perfect, locally grown, produce. Tangerines of such sweet complex flavor, four or five varieties of strawberries each with a unique taste, sweet white peaches perfume the vendor’s stall; all this bounty is called the terreoir, which is something like the spirit of the land conveyed through the soil to the plant and its fruitfulness. It sounds pretty mystical, but, in fact, I’ve grown to respect the concept because it registers true. No farmers’ market I’ve been to in the states has such excellent produce. proud of her whole production from starting young geese, to preparing her cans of foi gras, to selling them. She loved sharing her knowledge with others. Viewing their whole production we saw that the Toulousan geese, the breed used for fois gras, came equipped with large pouches on both legs to help them store food to carry on long migratory flights. Although truly free range; these geese won’t fly away at migration time because they are so well fed at the farm. a cavist in one of the less publicized caves. Our real surprise though was the Côtes de Marmondais in our very own department the Lot et Garonne. We think the Beyroy wines from the left bank of the Garonne are especially fine. They are like the Bordeaux wines but just outside the defined Bordeaux-St Emillion-Pomerol area. Reasonably priced, they make very good wine really affordable. Our last indulgence is food. Not limiting ourselves to the market produce and meat, we have tried and re-tried a number of restaurants both near and far. Oh my goodness. Last night we sat in a tiny room over-looking the Lot River in Villeneuve and ate ravioli stuffed with foi gras, fish céviche, or a salad of lettuce, tiny octopus, tiny shrimp, tiny calamari, and smoked oysters for the entrée. The plate was of steak, fish flambéed in Armagnac, or skewered gambas (big, big shrimp) and St. Jacques (scallops). The dessert, a Tarte Tatin, was burn your tongue hot from the oven; it had been made especially for us. The wine, a St. Emilion, was superb. After dessert we had a very old, very smooth Armagnac. This is a really tiny restaurant; if they can serve 16 people at one sitting I would be surprised. How do they manage? Their daughter just passed her bacs and they will have her in university next year. I’ve eaten there a lot since we bought our house, so I’m growing to know them. hard to figure out what is best to see since the Perigord Noir is so rich with well-known and important sites. I know of serious reports that “Font de Gaume” will be closed soon because of excessive calcification, something even I have noticed over the last 15 years, so we absolutely went there and to “Les Cambarelles”. The Bastile day fireworks was truly overwhelming with echoing vibrations of the brilliant starbursts. The military parade with ancient representatives of long ago wars was strangely nostalgic even to us Americans. The greatest excitement for me is that the Tour de France will pass through Domme on the 27th of July! I am trying to find lodging near there but no luck so far. On my annual visit to Ste. Foy in Conques, I found myself wearing my best clothes. Odd for 3.5-hour drive. Then I realized I was dressing up to visit Ste. Foy contained by her remarkable golden reliquary. I think I honor most the role of the cultural trickster she plays in the mythology of her miracles. I think pretty highly of tricksters like Coyote in Native American myth or Huckleberry Finn and Br’er Rabbit in American myth. They are the ones who make way for the cultural changes coming and help all the rest of us adjust to them. That’s much of what Ste. Foy stands for for me, but there is more that I can’t express. It has to do with the snugness of the valley and its conques shell shape—the steep mountains/hills that rise above the village wildly forested but with a trail leading to the top. The mountain pasture in the distance has cattle grazing. Below it are two tiny white hermitages. The very antiquity of the place, little changed since the 11th C, is certainly compelling to me, as are my family associations with the place. The modern, magnificent, cloud-like windows of the church by the abstract artist Pierre Soulages (http://www.conques.com/visite17.htm) compel me to meditation. Although I hated them when I first visited Conques; with time and patience, I have come to count them the very best of the modern installations in Romanesque churches I have visited. During the day the tiny valley holds more than 300 cars and buses. Visitors crowd the town. They buy the cheap souvenirs pilgrims have always bought in pilgrimage towns. Artists perch above the Abbey Church and sketch its roof of slate, its rounded apsidiols, its lantern and bell towers. Then most of the cars and busses, tourists and artists flee the village, leaving it quiet and peaceful. The boy scouts stay on, as do the walking pilgrims. A few cars remain in the remote parking. Travelers, determined to enjoy the peace of the evening and the organ concert before vespers, stay on in lodgings used to shelter travelers for many centuries. In the morning, especially on a Sunday, life starts quietly, but the 10 am mass completely fills the sanctuary. A visiting children’s’ choir participates in the mass. A young man wearing a t-shirt bearing English words about chaos and destruction is selected by one of the monks to read part of the service. Several other monks line up in the narthex, one of them swinging spicy incense. They process forward and the mass starts. The fragrance of the incense is even stronger than that swung high over the crossing at Santiago de Compostella! The rain has stopped and spring turns to early summer. The rain has left its mark upon the town and upon us. A month ago part of a rampart wall fell down taking all of one house and part of another with it. The house that went was not lived in and the city couldn’t find all the heirs in order to take it off their hands and sell it. It is/was one of the “best” houses in the village if restored but it sat there vacant and moldering with a bad hole in the roof. The rains of May took it out; although I think it is very salvageable, others think it is destroyed! The property belongs to a large Algerian family brought to Cancon after the Algerian Revolution and given a free house. The house next door is wrecked now too. It belongs to an elderly woman who is deeply entrenched in Cancon. Her home has been in her family for at least 5 generations and probably more. Pierrette and her partner Andre live in French Canada, but they spend the summer in this, her family home, which she cherishes beyond stone and mortar. They maintain their property impeccably but the interdependence of the homes built in the Quartier Haute demands a community of responsibility not just that of a single householder. The interdependence of the village buildings reflects the deep structure of the ancient region. The suburban villas are separate, independent spaces. I don’t see how the depth of community is possible for them that it is for us in the old quarter. It is the commonality of space that starts to bring us together. We have had a Bordeaux architect and her minions with lasers and other electronic tools meet here with us, our builder, and, most important the Architect du Batiments de France to discover what we can do about our houses. We bought the ruin across the street from our first building to help maintain our property values. It’s a beautiful building with two house addresses. It was the finest home in town. Its front elevation is sophisticated in a 14th c. way and from the back there is a view over the whole magnificent valley. It lost its roof 2 years ago and is in desperate need of stabilization. The architects tut-tuted about its beauty and its dangers. And we agreed with them. Another house on the Place de Marronnier has sold the mayor tells us. That is good, Although unlived in for a long time; it is in pretty good shape except for a roof that needs replacing. It is next to the churchyard and is much larger than it looks. We don’t know if its buyers are French yet but we suspect not. The mayor says the church will be restored perhaps in three years time, perhaps longer. That is good for our Quartier Haute too. Now, prospective buyers of the Presbytere (350,000 Euros) look at the church and walk away. We have begun an oral history of 324-325 Porte Fausse (AKA “the house across the street”). The house the wall of which fell in. Pierette Delibon’s grandmother was born in 325 Rue Porte Fausse in 1856. Her father was an ebaniste and made all the family furniture as well as for his clients. His atelier was on the ground floor of 324. Pierette has all the furniture her great grandfather made in her home on the Rue Mangane. She and Andre have been driven from that house by the collapse of the one next door. That collapse was due to no maintenance by the heirs of the Algerian family given the house by the French government as a reward for fighting with the French during the Algerian revolution. Their common wall was weakened when the city had fancy new paving installed 3 years ago; no insurance claims responsibility, neither town nor contractor. The Delibons are not even allowed into their home unless a fire fighter is with them. They cannot even retrieve their clothes let alone the heirloom furniture. The fabric of the town wall was pierced by negligence. The fabric of the town is pierced even more. So great is her love of Cancon that Pierrette and Andre have lived every summer here in the house of one of her grandfathers. Andre is Quebecoise and their home is in Canada. They will leave Cancon July 15 for good. Perhaps insurance will cover home repair but Pierette’s heart has been pierced along with the wall. When they leave more of the history of the town will be lost and the new world will claim them wholly. What a terrible pity that at age 78 Pierrette is forced to renounce her heritage. She knows that none of her family care but she cares deeply. We have interviewed her a couple of times. We found out her grandmother was born in “the house across the street.” We have heard her stories of the courting of her grandmother and her grandfather at that house. Her grandfather was an ebaniste and the ground floor of 324 was his atelier. She has 200 postcards and photos dating from 1800 thru 1960, which she will copy in Canada and send to us in the US. One is of the last mass at the church across the street, 1903. There are many scenes of the street in earlier times. Her great great grandfather, Albert DORDONAIS painter and freedom fighter, fought in the revolution in Paris. He kept documents of revolutionaries and brought them to Cancon. His name is perhaps one adopted in the revolution, but his entry papers only referred to him as son of immigrant.
? Year born, immigrated, revolution? What more is there to know? We at least have a start on the history of this 14th C house built into the castle wall. Well, well, well here we are in Cancon— it feels like we’re in a well; it’s so wet. We progress quite well on the house and then we get stuck because of the incredibly rainy weather. May has never been like this in the last 15 years we’ve been coming to the area. Yesterday, we tried to sandblast the wood on the upper floors. It rained so hard we couldn’t even bring the sand into the house. Today is the day. It will be transformative— dark, dirty beams and half timbering turned to warm, ancient oak still positioned in the walls and floors and ceilings but fresh again after 100’s of years. The electric and the plumbing are almost completely finished. But the roof is leaking so badly again that we can’t install all the drywall. We’re replacing the roof but the roofers are so busy and so backed up that we won’t have the new one ‘til September or October. The taste of the region—the soil, the sun, the air, and the care are always there in produce or in cheese, dry sausage, roasted chicken, or snails in garlic and butter. The sweetest strawberries are so fragile we can hardly get them home without bruising them. The food we cook is always remarkable, and we’re always eating. The daily markets bustle but are not over-crowded. We can chat with the vendors. Many speak enough English that with our French we get by and they introduce us to other English-speaking shoppers! We meet people we’ll see again, both French and English. Usually the sun shines or the clouds roll back when we plan a shopping trip. How uncanny. It is a time when the vide-greniers are held rain or shine. You either dodge rain or you are in full sun. Yesterday it was a full-sun vide-grenier just 15 minutes away in a cul-de-sac of newer bungalows with lawns and gardens, just below the medieval citadel of Monflanquin. This vide-grenier was like a block party. Nobody sold much but everybody had a Sunday celebration as a community. We stayed so long that we too became part of the party. One vendor sold sausages, pommes-frites, beer, wine, eau-de-vie, soda, water; you name it. He and his son did a brisk business. Neighbors shared lunches with their neighbors in front yards near their stands. The community was mostly middle aged. A few people were old; a few more were young. Little kids ran around playing dress-up in fancy shoes from somebody’s table. We almost bought a vintage wine rack, but it was too big to fit where we needed to put it. Daniel bought old vinyl 45’s for his DJ work. Peter found good little things to use to make clay stamps. Rob and Adam found pipes, and I found two old wood marquetry images of Tintin book covers. They are amazing kitsch, but also beautiful! We even found the perfect glass doors for our terrace and a new, hollow, 16’ oak beam to use heaven knows where in the house. Our little car has a roof-rack, still we had to make a couple of trips to get it all home. While our young men carried the first load home, Peter and I hung out, ate, and browsed some more. One of the younger neighbors struck up a conversation. He’s a high school teacher in Monflanquin and his father had been the town’s printer. We exchanged names and he gave us his news about restoring the 13th c. building the print shop had been in on the Place. Our car came back for another load. We all lingered chatting and feeling very peaceful and privileged. It remains totally beautiful here no matter what the weather. The landscape changes so quickly I just can’t photograph its nuances fast enough. In April there were rivers of vibrant yellow rapeseed flowing down the valleys. Everything else was in young greens. Now some of the wheat has been harvested and hay bales dot the fields. It’s a wonder they got it in dry considering the weather. The road to Villeneuve is on a ridgeline. It is my favorite view. On either side of the road the hills display a medley of changing colors. Driving to Villeneuve I’d watch a farmer plowing on the rolling hills. The light brown soil turned a rich crumbly dark brown as he turned it over. Now young corn is growing in some of those fields. In many others the sunflowers are planted. By mid-July these will replace the rivers of yellow rapeseed with yellow and brown but that new intense yellow will repeat a memory of April. The colors of late May are more varied than those of mid-April. They fulfill the promise of the early spring. Although the greens are darker, more sober, the regimens of fruit orchards, nut groves, and poplar plantations seen from the road above are so full of rounded regularity that their fullness is voluptuous. Well-pruned plum trees of almost any age become round green balls that seem soft and comfortable. The mature hazelnut trees mass together in solid but almost feathery plots. There’s a striking difference in the profiles of the poplars. In the plantations they rise tall and regular with even sides and tops. They too must be pruned and cared for. Single rows of poplars along a creek or roadside or on the skyline contribute to our remembrance of Tuscan landscapes. My heart is torn again when I remember the devastation of last year’s tornado. Now I understand it’s meaning to this agrarian world at a more fundamental level, something beyond the economic effects. Today there is new growth. Most orchards have been replanted. The sycamores along the roads have all been pollarded to the same height and will be back in harmony with each other in a year or two. The vision from the ridgeline roadway is once again whole and harmonious. Here the collaboration of human beings and nature renews the landscape just as it has for centuries. Only water towers and electric lines alter the ancient rhythm. The people and the land together reflect life measured in generations, not one season. Orchards, groves, and plantations are all planted for the distant future. I think the harmony is what I love most.